My goal is to run a half or full marathon in all 50 states. So far I’ve completed 30 half or full marathons in 22 different states. There have been races that are truly unique – like DisneyWorld races that run through the castle in the Magic Kingdom. At times, though, it feels like I am running the same race just in a different place. Not so with my most recent half marathon in St. Charles, Missouri. The MO’ Cowbell Half Marathon was just, well, MO’ fun. The inspiration for the race was the More Cowbell skit from Saturday Night Live (SNL) with Will Ferrell and Christopher Walken. The skit portrays what the recording of the song “Don’t Fear the Reaper” by Blue Oyster Cult might have looked like. Diehard SNL fans put this skit in their list of Top 10 favorites. The race name is also a play on the postal abbreviation for Missouri – MO. They came up with some creative uses of “MO” too. I traveled to St. Charles and made my way to the ExMO’ (the race expo). Each runner was given a cowbell with their bib. We were told to bring our cowbells to the start line so we could ring our cowbells to “Don’t Fear the Reaper” before the race. With approximately 5,000 runners entered in the full and half marathon, that would be a lot of cowbells. I had some extra time before race day so I took time to see some of the local attractions. 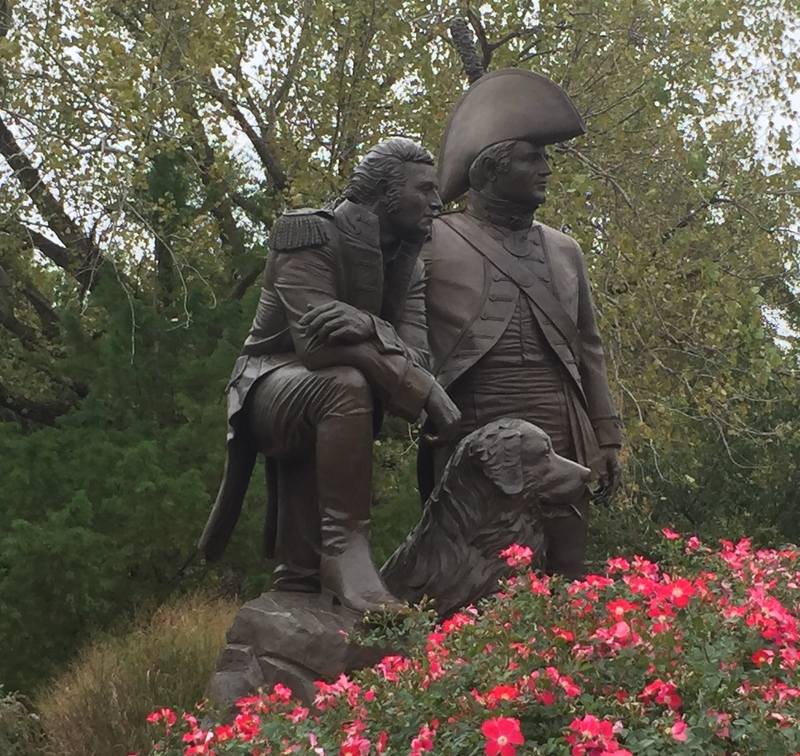 I walked through St. Charles, the starting point for Louis and Clark’s expedition that ultimately ended at the Pacific Ocean. The cobblestone streets are lined with historic old buildings that house shops and restaurants. 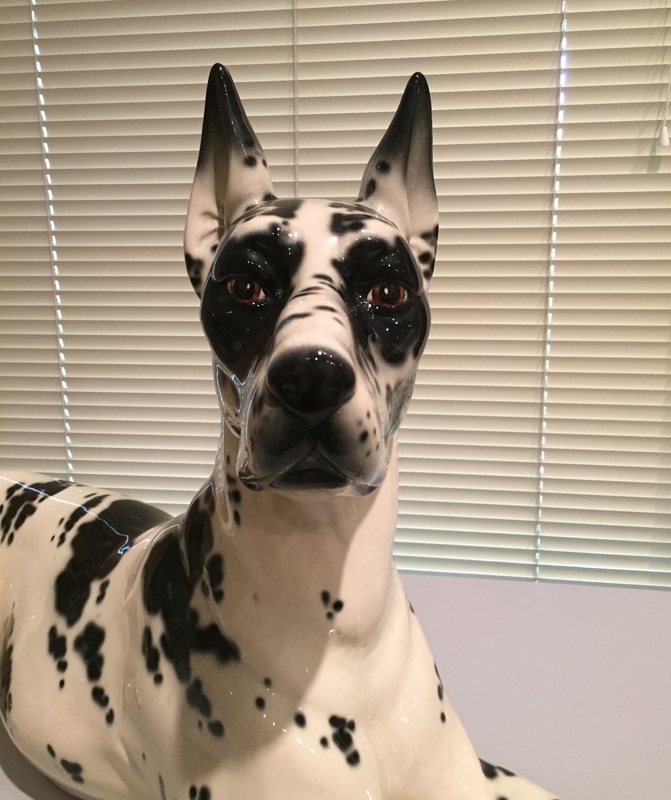 Next I headed over to Queeny Park in St. Louis to visit the Museum of the Dog. 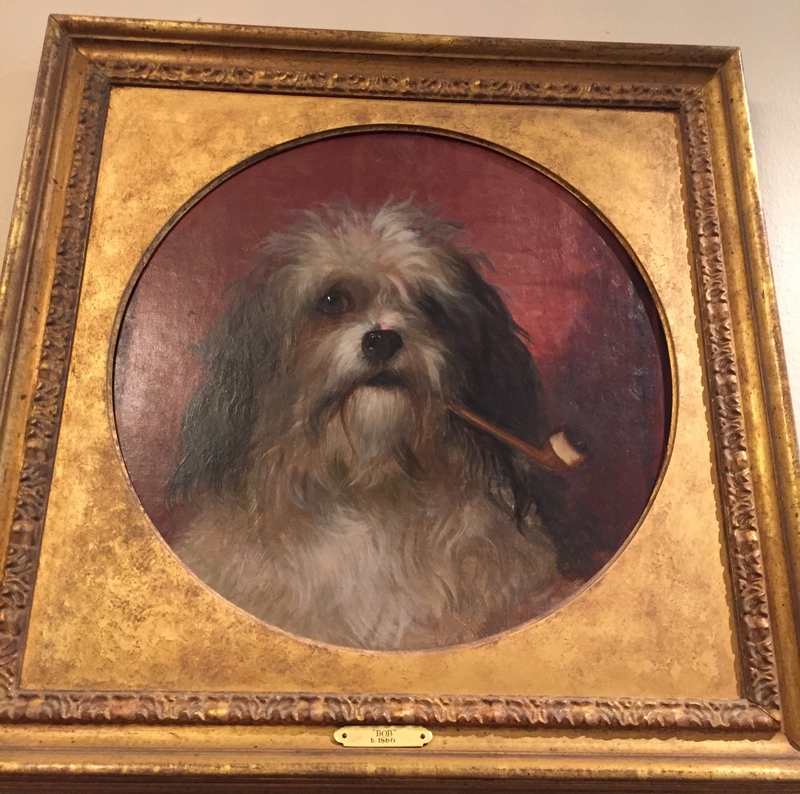 The museum has the most impressive collection of dog art that I have ever seen including paintings, drawings, watercolors, bronzes and porcelain figures of all sorts of dog breeds. I even got to meet the “Guest Dog of the Week”, a papillon with titles in breed and agility. Sunday morning was race day. It was cold when I headed down to the runner’s village. As I huddled on a bench wearing a plastic bag to fend off the wind, I wished I had paid extra for access to the MO’VIP area. They had heaters and private bathrooms. The bag check was located next to the biggest cowbell I have ever seen. You could ring the bell if you got a PR (personal record). Before the race, I stood looking at that bell. More than anything I wanted to be able to get a PR and have an opportunity to ring it. Many runners were dressed in cow costumes or wearing cow-inspired running gear like spotted cow socks. This was the 5th anniversary of the MO’Cowbell race and the race announcer mentioned there were a number of runners who had run all five years (known as MO’riginals). The race kicked off on time. I was disappointed that the pre-race tradition of runners ringing their cowbells to “Don’t Fear the Reaper” didn’t happen. I think I only heard the song played briefly before the race started. It wasn’t a big deal – I had left my cowbell back in my hotel room. Although I had just run a full marathon the previous week in Berlin, with a twisted ankle no less, I was feeling strong as I headed out. 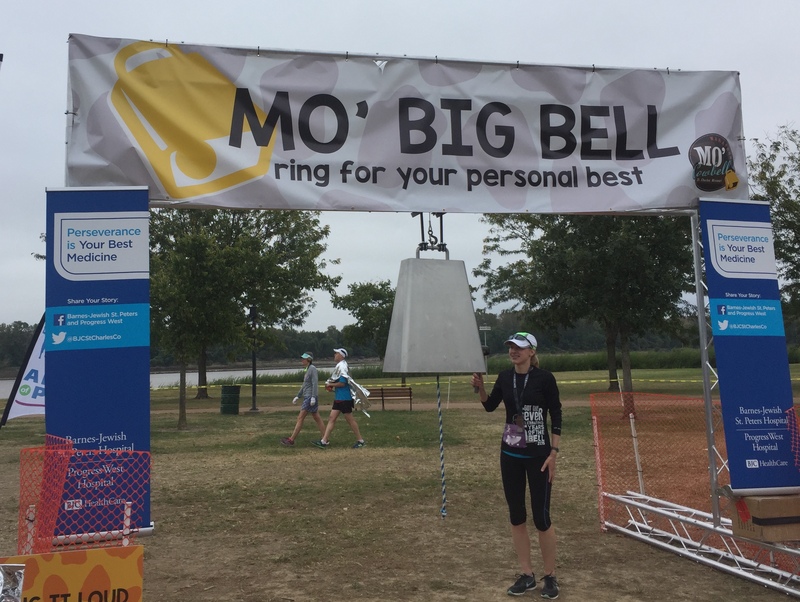 My brain was focused on getting a PR so I could ring that darn bell. The first 4 miles or so of the course were asphalt and pretty easy. Then we hit concrete roads. I feel a noticeable difference when I run on concrete. My body hurts more. I kept pushing myself though. How cool would it be to get a PR in the half marathon just a week after getting a PR in the full marathon? When I reached the halfway point of the half marathon, I could tell that I was slowing down. Mile 10 was the MO’tivational Mile where there were cheering spectators to encourage the runners as they ran up a very long hill. That hill took its toll on me. Although the last mile or so of the course was back on asphalt, I was done. I didn’t have anything left to keep up my pace for a PR. I finished within 1 minute and 36 seconds of my half marathon PR – not too shabby and still my fastest half marathon this year. I stopped to watch people at the big cowbell, disappointed because I didn’t get to ring it. I later learned that anyone could have their picture taken ringing the bell. But it wouldn’t be the same for me. I only wanted to do it if I got a PR. 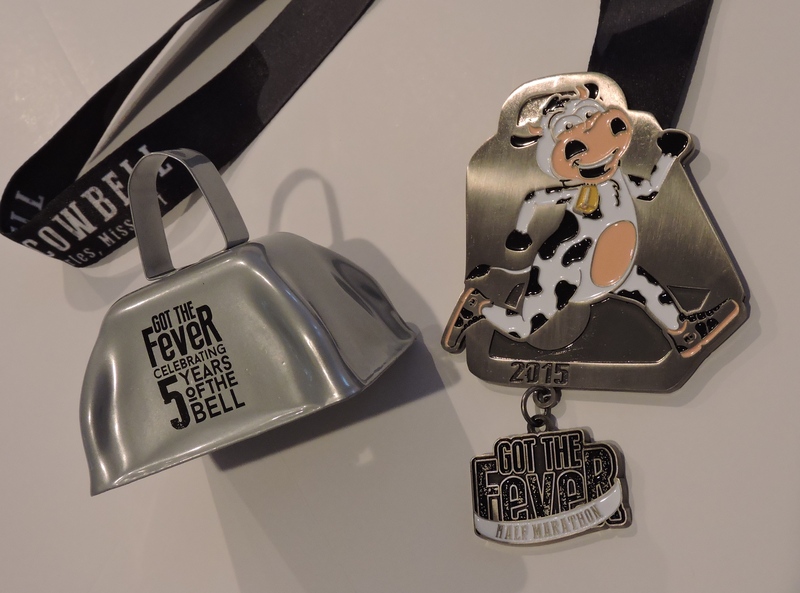 When I got back home and was updating my race records, I noticed that I have run a number of races this year with animal themes – the Kentucky Derby Mini-Marathon (horse), the Flying Pig Half Marathon (pig), and the MO’Cowbell Half Marathon (cow). I just need a chicken-themed half marathon to round out my year of barnyard animal races. Since I can’t find one, I entered a Turkey Trot 5K on Thanksgiving. Close enough. In case you haven’t seen SNL’s More Cowbell skit, here is a link to the Hulu website where you can watch it.